Our laminar model of the layers 4 and 2/3 of V1 addresses development of the horizontal connections found in these two cortical layers as well as configuration-specific facilitation phenomena . We assumed that in both these cortical layers synapse strengths are subject to change due to visual experience. In the model, poorly tuned LGN input targets solely layer 4, whereas layer 2/3 receives sensory input from layer 4. Based on these assumptions, the model demonstrates how correlation based networks of horizontal connections are developed simultaneously in both these layers. Rapid improvement of orientation selectivity (OS) during the first weeks after eye opening, when the eyes are subject to normal visual experience has been reported earlier in several species [2, 3]. Note that this critical period coincides with the development of the horizontal connections . A fully developed layer 2/3 network consists of elongated summations pools. Thus, each minicolumn model receives input from a region that is axially specific along its orientation axis. In this network, modular specificity is prominent as well, i.e. projections target mainly iso-orientation domains. The elongated summation pools in layer 2/3 can address configuration-specific facilitation phenomena (Figure 1). Simulation results suggest that the visibility of a grating stimulus is improved due to its elongation along the direction that coincides with orientation axis. Elongation of a grating stimulus along the orthogonal axis results in a less prominent facilitation. 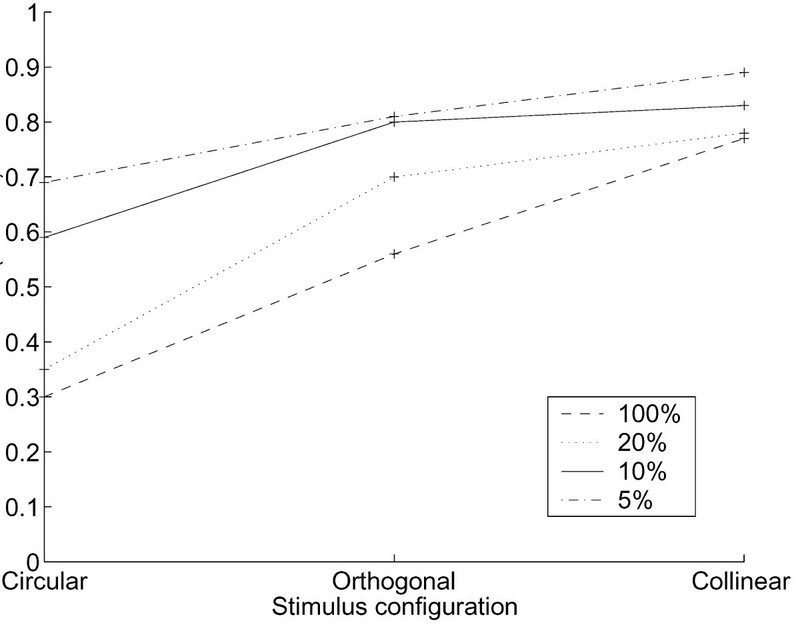 In both cases facilitation effects are more prominent in low-contrast conditions. In this model the layer 4 network is isotropic and hence does not take part in the facilitation process. Thus, we hypothesize that anisotropic recurrent connections found in layer 2/3 are sufficient for explaining this phenomenon. Probability of correct detection for a layer 2/3 minicolumn model is a function of both stimulus configuration and contrast. Network behavior is investigated on four contrast levels (5, 10, 20, and 100%), and three stimulus configurations (circular, orthogonal and collinear configuration).